Unlock your nubia N1 lite in just 0.3 seconds*, even when the screen is turned off. Also supports fingerprint scanning to unlock APPs and files. Unlock with the gentle touch of your fingertips - safer and more convenient. 5.5" HD display brings an amazing viewing experience. Thanks to dynamic contrast, adaptive brightness and many other advanced technologies, the screen is more energy-efficient, healthier to the eyes, and can be viewed clearly even under direct sunlight. nubia N1 lite is equipped with a front soft-light flash. Along with the selfie beauty algorithm, nubia N1 lite can enhance your beauty in both day or night photos. The F2.0 large aperture rear camera ensures 20% more light enter the camera than F2.2, which is commonly seen in the market. The dual LED flash for the rear camera also provides brigther and clearer night-time photos. The quad-core 64 bit CPU combines advantages of both high performance and low power consumption. 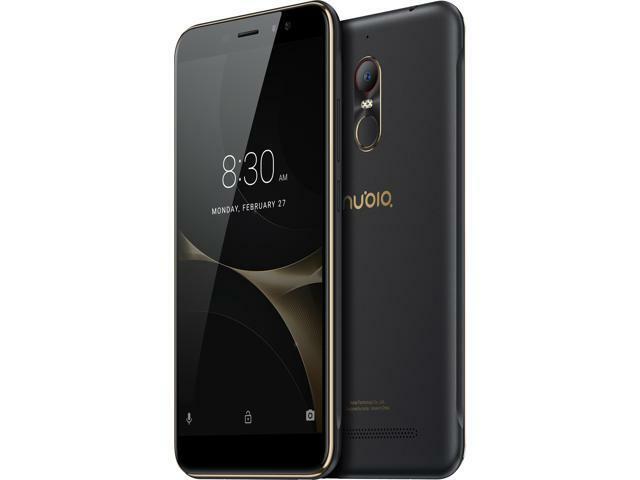 With a faster RAM, larger storage, better 4G LTE network support, a more convenient Dual SIM Dual Standby (DSDS), and along with its 3000mAh (typical) high capacity battery, nubia N1 lite provides an exceptional experience to users. The 2.5D glass in the front and the edge arc on the back give a sense of roundness and completeness to the phone's body. The bevelled design on the side provides a more comfortable grip, and is more easier to perceive. The UV coating process gives a pebble-like fine-sanded feeling. The back camera and fingerprint panel's "UniPanel" design creates a sense of oneness on the back. And what's more, the metal elements and the CD laser give nubia N1 lite an aura of nobility. 6.02" x 3.05" x 0.33"
Cons: Manufacturer does not have a valid contact phone, neither they respond to email, so this phone is without warranty, be aware of this. Other Thoughts: The phone is great especially considering the cost. It is durable, performs well, and is easily fixable. The entire phone can be disassembled and reconstructed very easily for the moderately technically minded which makes repairing this phone wonderfully simple. Above that, you have the price of the phone which is so low you can easily order a second one to have a source of parts to work with and STILL spend less than an average smartphone. Other Thoughts: pairing with bluetooth is frustrating, need to reboot daily to reset wifi, phone call quality is good, as is outdoor picture quality. Indoor pictures not great, and performance is adequate for the cheap price. Battery life is pretty good after 6+ months of medium usage. I hope to get a year of service out of the phone. Cons: Non-replaceable batt, optional cover/case must come off to recharge, sound volume could be louder and sometimes I have to reboot to connect with wifi. Other Thoughts: I would recommend this purely for use like a tablet, or with an added case for someone who never plays games and who cares nothing about speed. For everyone else, just spend $30 more and pick up a significantly better phone. Pros: big ram! big ROM! Excellent screen, dual sim! very balanced phone. Cons: if the RAM is larger, it will be better! Cons: If the battery drained to zero and the phone was then charged and turned on a series of red bars would appear on the screen and green Chinese letters/symbols would appear and the phone would reboot to the same issue. I assume it was some kind of diagnostic mode but I could not get the phone to come back to normal operations unless the battery was 100% charged and then after about a month of use it would not turn on at all no matter how long the phone was charged for. I lost all the data that was on the phone. Be careful with this model and if you get the Chinese boot screen and can get your phone to work after that I recommend you back up all your data immediately!!! Pros: Good display works well with Wi-Fi - makes a great small e-reader Seems fast enough for normal use and was mostly set up from my old phone. Cons: Problems getting mobile data working as well as text messages. You can not transfer files or even look at content on the SD card via USB to a computer- The SD card is under the back cover so removal is a poor choice. THIS PHONE IS NOT COMPATABLE WITH CONSUMER CELLULAR DATA! Other Thoughts: At this point I would not recommend this phone except for the most basic user. I sent an email to support at Nubia and after 5 days no answer to questions! !